'Independence' was an important ideal for men in Georgian England. In this period, however, the word meant much more than simply the virtues of self-sufficiency and impartiality. Most people believed that obligations absolutely compromised freedom and conscience, whereas 'independence' was associated with manly virtue and physical vigour. Fundamentally, the political world was thought to consist of 'independent men', exercising their consciences and standing up for the general good. As such, Georgians thought about political action and masculine virtue very differently to the ways in which we do today. In this study, newly available in paperback, Matthew McCormack establishes the links between the histories of masculinity and politics, highlighting the centrality of 'manly' ideals in the political world and - conversely - the role of politics in the operation of gender ideology. 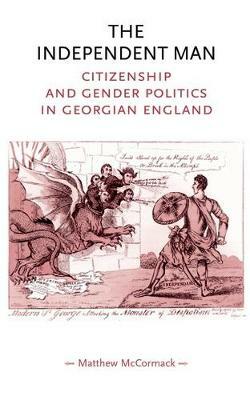 'In exploring the relationship between gendered ideas of masculine behaviour and concepts of the political individual, this important book fills a yawning gap in both political history and gender history of the eighteenth century.' Karen Harvey, Reviews in History 'To say that this book on masculinity and Georgian politics in long overdue does not take away from Matthew McCormack's achievement... It has been left to McCormack to re-conceptualize the history of political subjectivity through gender's powerful organizing frame.' Timothy Jenks, Canadian Review of History 'This is a very thoughtful and thought-provoking study of the meaning of the term 'independent' in Georgian England. McCormack moves beyond high politics and social history to combine the two in a fascinating discussion of electoral history.' Emma McLeod, University of Stirling (History - the journal of the Historical Association) -- .